An evening of music (and dancing) from the tutors of our 2018 Hurdy Gurdy & Bagpipe Weekend. Claire Dugué a native of France, encountered the hurdy-gurdy in London during her college training as an instrument maker. 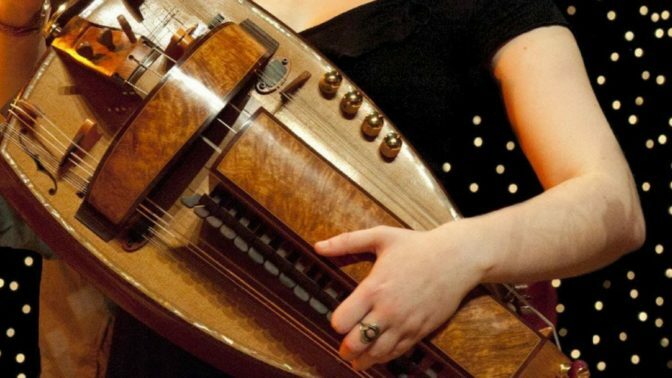 She was captivated by the instrument and has been making hurdy-gurdies ever since. David Faulkner has been playing pipes for over 25 years with groups such as the Eel Grinders and Jon Swayne’s Zephyrus, and performs regularly as a duet with accordionist Steve Turner. He has toured in Europe, Canada and America. He has led many pipe courses in the UK and abroad and has worked as a community musician for nearly 20 years. Olle Geris is highly regarded as one of the very best bagpipe makers and players. She grew up in a very artistic and musical family. As a child she learned the flute, but soon she shared the passion for bagpipes with her father, with whom she went to take a bagpipe class in Brussels. When the opportunity came to begin in the workshop of Remy Dubois (the famous Belgium pipe maker) as apprentice bagpiper, she made the choice to focus entirely on learning how to make this instrument. In 1995, she won the first prize at the St.Chartier Competition in duo with Machteld Truyens. She participates in many concerts in different formations: Willem Schot, Swart & Co, Zefiro Torna, Camerata Trajectina, Rans Flagel, Göze, Idool 1900… She has conducted many courses for making reeds or for the bagpipe. She took over the bagpipe making workshop “D’un souffle a l’autre” in 2009.